Ann Arbor residents know to call A.H. Construction & Roofing Company for all of their roofing needs. 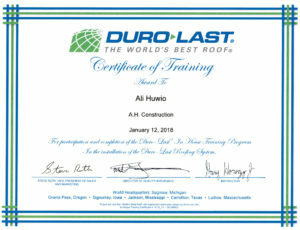 Founded by owner Ali Huwio in 1987, A.H. Construction & Roofing Company has set itself apart from the competition since day one by offering great customer service, the use of quality materials and superior standards of workmanship. A.H. Construction & Roofing Company is the leader in end-to-end roofing services. We specialize in roof repairs, roof replacement, tear-offs, re-roofs, ice dam removal, heavy snow shoveling, roof maintenance and more. On call 24/7, year-round, we can also help in the event of a roofing emergency such as a fallen tree limb or buckled roof. What types of roofs do we service? In our almost three decades in business, we have serviced nearly every type of roof material including asphalt, tile, concrete, cedar shake, metal, plastic polymer and speciality or obsolete tile. We have also installed all manner of roofs including flat, metal, gabled, A-frame, and more. How do we make our customers feel appreciated? A 100% satisfaction guarantee with each job we do, or your money back. A 100% no-leak guarantee on all newly-installed roofs, or your money back. That roofs will be installed in one day or less. That every team member on our payroll is licensed, insured and fully-bonded. That our owner, Ali, will be on site at every job to ensure that your project is on-time and on-budget. That, if needed, our in-house insurance claims specialists will help you correctly file your insurance claim. That all new customers will receive a free roof inspection and comprehensive, no-obligation job estimate. These are only a few of the reasons to partner with us for your roofing needs. Call us today at 734-481-1983 to schedule your free inspection, or for more information on our quality roofing services. We guarantee that no other roofing contractor will hold a candle to the quality, affordability or timeliness that A.H. Construction & Roofing Company delivers again and again. We are the number one choice when it comes to protecting your roof–and we can’t wait to show you first-hand what makes us a top choice. For 24 Hour Roof Repair Service in Ann Arbor call A.H. Construction & Roofing today!